The 9th recording of our Beginners at Home Love Energy Techniques is now available. This amazingly unique recording teaches you how to activate a Merkaba and guides you in a bilocation to the safety of our 23 acre/9 hectare Love Energy Sanctuary so you may self help and self heal yourself while in the comfort of your home. 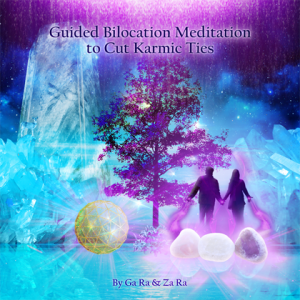 A series of Love Energizing Ceremonies by Ga Ra and Za Ra in our one of a kind Healing Chamber stored Unconditional Love Energies into each set of 3 Healing Crystals. Our recording enables one to attain a temporary state of Enlightenment and activate a Merkaba using Unconditional Love Energies of Joy in a way that empowers one to bilocate to our Love Energy Sanctuary. This 9th recording is the most wondrous gift of all time. Playing the recording was an unforgettable experience. Events and people I had forgotten popped up and then cutting the ties brought in so much comfort that brought tears at one time. The white rays seemed to go so deep into the physical and emotional bodies for cleansing. Feeling the waves of energies in the air around me from the new ‘Two Becoming One’ was so caressing and healing. The energies of bliss enveloped me and I felt I was relaxing and letting go with every breath. It was totally transformational and left me wanting to listen to it again soon. The wisdom is wonderful and after it I felt set to go into the meditation with understanding. The first part of the meditation to get us ready to bilocate made my body feel like it melted into the Unconditional Love Energies. When the cutting of karmic ties started it was wondrous. I felt such an excitation in me and it felt so vivid to be at the Sacred Sanctuary having the Teraphim spheres work with me. After that amazing session I felt the love start to rush in. It was so intense but in a gentle way. It felt like each one of the atoms in my body was getting tickled and the swirling felt immense. It was wonderful to go through our memories but not relive them. I felt like I was in full participation. Upon finishing the meditation I felt totally in bliss. All I can say is that I feel immensely changed in a very short time and I can already feel a big change in my physical and emotional health. I listened to the Guided Bilocation and the listened to the Karma recording and then listened to the Guided Bilocation again last night. It was a beautiful experience. After listening to the Guided Bilocation the first time, the energies were extremely high. I just sat there for some time in the most wondrous energies. It felt like such a freeing experience. I took a break, and then I listened to Karma. I felt the true me even more coming out from under all of the yucky energies of experiences in this world. I listened to the Guided Bilocation once again. This time, I really feel myself floating into the golden hut and surrounded by the crystal spheres all around me, while holding my three crystals. It was the most amazing experience. I feel freer than I have ever felt. I am truly grateful of this beautiful gift. The first time I played the recording, I was so blasted by the Love energies and my energies were being so utterly rearranged that I couldn’t speak and it took me several days to integrate the energies. I experienced an incredible lightness of being and felt the weight of the world being lifted off my shoulders. It is an extraordinarily powerful de-stressor. Upon experiencing it for a second time, I was able to participate more fully and better observe the intricacies of the powerful Love energies and the sheer mastery of how my three healing crystals from you danced within the healing chamber. I could detect discernible shifts at times during the tie cutting and it felt as though healing energies would then coalesce around the area where a karmic tie had been cut. It is especially amazing how deeply buried emotional energies can be rooted out, cleansed and healed without having to re-live one’s pain-filled memories. I listened to the Guided Bilocation Meditation today. The energies were fantastic…every bit as powerful as a Love Fest. The energies just carried me away. I love the fact that the Song of Love was used many times over the course of the entire meditation. I did have a lot of memories and images of people and events that came up for tie cutting and cleansing. It was an amazing experience. When the meditation was over, I sat in the chair for a while, not able to move. I strongly recommend that anyone who listens to the Guided Bilocation Meditation allow for a long recovery period…its that powerful.